Drawn from the Morgan's collection, the exhibition examines the origins of modern scenic design and chronicles the evolution of stage sets during the highly innovative period of ca. 1900 to 1970. Modern technology and materials allowed for innovative approaches to stage sets. Furthermore, new theories concerning the role of the actor and set in theatrical performances encouraged radical change. Imagination and vision were encouraged allowing a vital and varied stagecraft to emerge throughout England, Europe, Russia, and America. On view are over fifty drawings derived entirely from the Morgan's holdings, principally from the collection formed by the celebrated American set designer Donald Oenslager. Enriching these color drawings is related material, including musical scores, rare books, and autograph manuscripts as well as more than thirty performance photographs documenting finished sets. 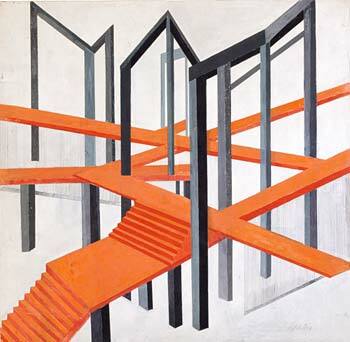 The exhibition is divided into four thematic sections—Origins of Modern Scenic Theory, Destroying Tradition, the Russian Avant-Garde, and Diversity of the American Stage—together emphasizing the international scope of advances in set design. This exhibition is made possible through the generosity of Jane and Robert Carroll and Eliot and Wilson Nolen. Generous assistance is also provided by the David L. Klein Jr. Foundation and The Tobin Theatre Arts Fund. Signed in graphite at lower right, A. Exter.